Do you know how hard it is covering up even just a tiny bit of today's glitter? It literally pained me to apply any strokes of a different color to Sneeze Breeze, a sick blue glitter from TheHungryAsian. That also may have been from the recent increase in weights during YPump, but let's attribute it to the gorgeous polish shall we? After all, this is Nailed It, not Wailed It. I thought it appropriate to add roses to Sneeze Breeze. It's Attack of the Cottonwoods out here in Boulder, as day after day, little soft fluffy cotton drifts breeze around town. It's beautiful, especially at night when cars' headlights capture them moving across the surface of the roads, but I'd be lying if I said I wasn't constantly pumped full of allergy medicine. Stupid gorgeous nature! The roses were done with Hot Like Lava (Color Club), White On (Sally Hansen Xtreme Wear), Be My Valentine (Sinful Colors), Green (Color Madric), and a hint of Me First (Sinful Colors). Whew! I layered Sneeze Breeze over Swimsuit...Nailed It! (OPI) because I didn't want to waste any of it. They actually appear quite close in color at first glance, but the OPI doesn't pack the neon punch like Sneeze Breeze. 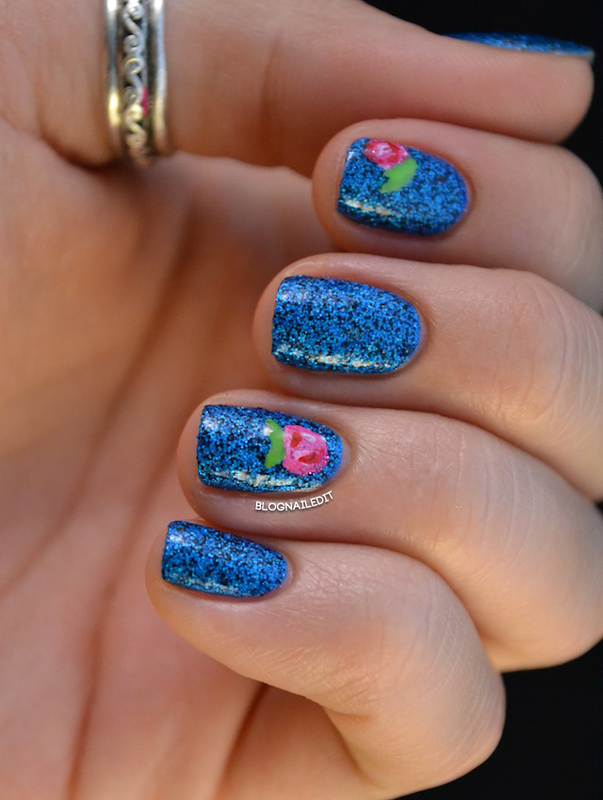 I don't know where Kae (TheHungryAsian's shop owner) found the blue glitter used in this, but it's a mind-melter. Is it neon? Is it shimmering? Is there more than one color of blue in there? I wish I had these answers, but alas, my glitter envy stops at buying polishes, not making them. This is soooo pretty!! Oh how I love the look of Sneeze Breeze! The name goes well with your allergies XD!! Before I remembered to name the post "Glitter and Nail Art: Day 3" I had it named "Allergic to Roses". Oh well! Gorgeous. Everytime I see Sneezr Breeze on someone, I feel jealous. Great polish. Great design. I love the roses on top. Lovely design and gorgeous colour!